Pure glistening white chalice-shaped flowers bloom in early summer. Pair with pink 'Rainbow Loveliness' or annual phlox. Self sows. Starting Indoors: Sow in pots 6-8 weeks before last frost; cover with plastic to retain moisture while seeds germinate. Keep at 50-60°F and provide light. Thin about 1-2 weeks after germination. 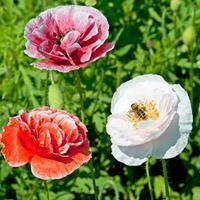 Be very gentle when transplanting, as poppies do not like to be disturbed. Starting Outdoors: Recommended. Direct sow 4 weeks before last spring frost or in late autumn (Autumn only in zones 8+). At last spring frost date. Poppies are a must in the cottage garden, and the classic Shirley Poppy cannot be forgotten. They have a more unusual texture and function perfectly as back borders or along a fence, but will be just lovely almost anywhere with full sun and rich, moist, well-drained soil. Watering Details: These plants prefer evenly moist soil, but can tolerate drought. About an inch of water per week is more than sufficient once they are established. Soil pH: Slightly acidic to neutral—if soil is acidic, add some lime before planting. Fertilizer: Scratch in a couple of inches of compost prior to planting. Alternatively, feed monthly with an organic liquid feed. Diseases & Pests: Fungal diseases can be prevented by regularly spraying with organic fungicides and spacing at least 1' apart for good air circulation. If slugs and snails damage seedlings, sprinkle the surrounding soil with pelletized iron phosphate, crushed eggshells, or diatomaceous earth. Plant: Prickly green stems with somewhat thick, fern-like to lacey foliage with toothed edges. Seeds: Each flower will turn into a large globose capsule, containing many tiny blackish seeds, which will rattle when shaken once they are mature. Dried pods make interesting fall home décor. When to Cut: When buds develop color, do a simple initial cut to harvest. Next, bring some water to a boil. Cut stems to desired length and immediately dip and hold stem tips in the boiling water for about 20 seconds. Alternatively, sear the cut end of the stem. Either of these methods will make flower last longer. The specific epithet rhoeas is from a Latin name for red, referring to the species flower color, though there are quite a few varieties in other colors.